I remember the first time I ever tackled DIY - my sister wanted my mum to put up some shelves in her bedroom and I was enrolled to aid as a helping hand. We'd never been allowed to paint the walls (oh how I hated you, magnolia!) blu-tac posters to the wall or put up photo-frames, so shelves had previously been a definite NO NO. But for the first time ever, we were allowed to tamper with the walls and install an entire shelf! I was only fourteen at the time, so don't judge my terrible attempt too badly, but of course I had no clue how to put up a shelf and apparently nor did my mum. Other than a drill and some wall plugs and screws, we virtually had no other tools, not even a spirit level. The whole job was a far more stressful venture than I had ever imaged putting up shelves would be. My mum had no clue how to mark up where we needed to drill into the wall and it was a bit of a weird balancing act with one of us trying to hold up a large shelf and two brackets, whilst the other stood back demanding "move left, move right". It wasn't fun, easy, or anything I ever thought I wanted to do again. And yes, when we finally did get the shelves up, they were far from perfect. Simple DIY for some, is often a recipe for disaster for others. After all, I was never taught how to drill through a wall and attach some shelves at school - were you?! I've had numerous friends who have been totally put off by the idea of DIY - from hiring handy men to attach shelves, to having someone come and re-attach a door knob (but why, you only needed to replace the screws dammit?!) to even painting, DIY can be seriously daunting. Since that day, my DIY skills have come a long way, but it certainly hasn't been without its disasters. If I could go back in time and recommend one product to hang on the wall as a kind of 'starter' into DIY - it would be this mirror. For anyone unconfident, (or even those whom are confident, for that matter!) with this mirrors unique 'Hang N Lock' installation design, it allows you to alter the height/straightness of the bracket after you've drilled the holes, meaning you pretty much cannot go wrong. You can't hang it wonky, you don't need three hands trying to hold the mirror to the wall, whilst work out where you want it and where its fixing locations need to be, and you definitely don't need a dodgy assistant, the type that's more a hinderance than a helping hand. In fact, it makes you wonder why all things that need attaching to the wall aren't this simple?! This mirror is a total DIY ease. Short of being brave enough to drill a hole in the wall, you really need no other DIY skill. Instead of the mirror hanging on two exact located screws, the mirror has a long bar attached to the back that sits on a smaller bracket. We worked out roughly where we wanted to hang the wall bracket by measuring the distance between the bottom of the mirror and the bar it sits on. We marked this up on the wall, but it only needed to be a rough guide for height. No exact dimensions or spirit level required. Say what?! Then, holding the wall bracket under that mark, we drew two dots (one in each circle) where our holes needed to be drilled. You'll see the bracket has its own spirit level, but at this point it doesn't even matter if the bracket is level or not. We drilled the holes, using a vacuum to quickly collect the dust before it stained. And now the really easy and clever bit... By attaching the bracket loosely with screws, we could use the 'locking' mechanism to alter the position of the bracket. Turning the flat indent of each circle with a flat-head screwdriver would pivot the bracket up, down, left and right in a kind of circular movement allowing you to achieve the right height and a straight level. You can see where I'd drawn my guide line underneath the bracket and how much movement the bracket has to go up or down. We could position it on the line, about a cm or two above the line, or even a cm or so under the line, just by turning this mechanism. This meant we could play around with different heights of the mirror without drilling new holes, which was great because I actually decided to go for the inch higher higher location than where I'd drawn my original line. Once happy with the location and making sure the bracket is straight, you simply tighten those screws to stop any movement. It's really quite genius. But what if you wanted to move the mirror more right, or more left? Well... the long metal bar on the back of the mirror allows you to slide the mirror left or right several cm's each way whilst still being secure on the bracket, meaning you can position it how you want. No new holes required. Amazeballs. As for the mirror itself, I'm super fussy about quality - with cheaper mosaic surround mirrors, you'll often find the mosaic aspect isn't done with great care or precision and the glue that holds the mosaics in can often be gloopy and quite noticeable. I'm pleased to say, there was no visible glue on this mirror! The quality is great and it looks expensive too. I love the way the mosaic surround picks up different aspects of light - it almost glistens from certain angles. It's fun but also quite chic at the same time. I'm always a bit nervous about new large items of decor in case they don't suit the room, but it actually fits in really well with our heavily chromed out bathroom and I completely love it! The position of our mirror reflects the light from the window making the bathroom seem so much bigger and lighter already, which was much needed in this room! I also love the way it reflects into our glass shower enclosure. You can see a before and after below and how it's added a much needed finishing touch to the room.. The 'Hang N Lock' mirrors (and other bathroom accessories!) come in a variety of different styles and can be found online at Homebase, Wayfair or Croydex's own website here. 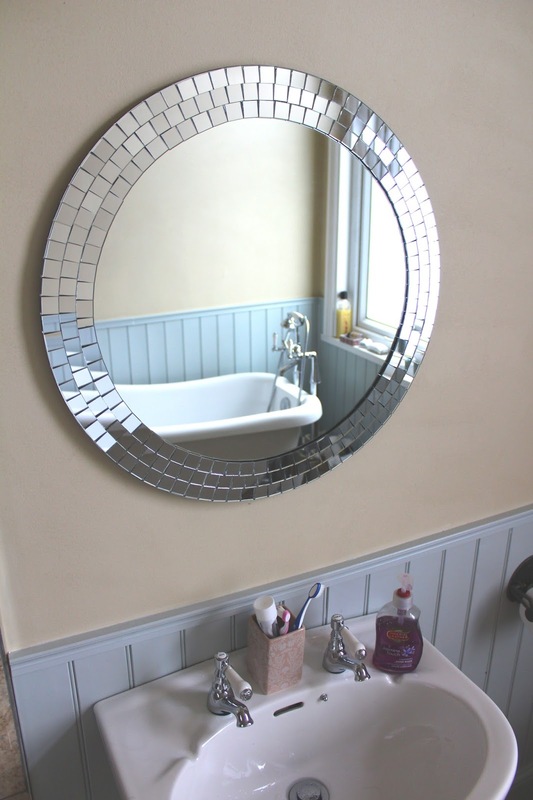 The one I've used and pictured above is the Meadley mosaic mirror, I think it's fab! If you're looking to get more hands-on in your home, but you lack some confidence, I definitely recommend starting with something simple and easy to install. Something like this mirror is exactly the kind of easy installation we needed on those shelves eleven years ago! I have a whole catalogue of terrible DIY jobs gone wrong and many are from hanging wonky shelves, photo frames or other wall hanging objects. Actually, we recently installed a new light switch, which yes, ended up slightly wonky for no obvious reason. Why is this still happening?! I love the simplicity of this design and I think I'll be forever wondering why nothing matches up in its ease of installation and why I'm still hanging everything with some difficulty. How confident with DIY are you? Do you remember your first-time DIY? I'd love to hear your stories! *Mirror was gifted for the purpose of this review, but all words, thoughts and opinions are my own. I only recommend products/brands I genuinely believe in and would use myself.